When I moved from Amarillo to Austin in 1992, my new friend, food writer John Morthland, introduced me to the wonders of Central Texas barbecue. There was nothing remotely like Lockhart's Kreuz Market up in the Texas Panhandle, and I fell hard for both their otherworldly 'cue and the building they'd occupied for almost a century. Smitty’s Market took over that sacred space in 1999, which remains one of the historical gems of the Texas barbecue world. A few years after the start of my love affair with smoky meats, I began to cover the larger Texas BBQ scene for Texas Monthly magazine and other regional publications. At that time I began to establish a familiarity with the folks who made all this possible--the pitmasters. Not every BBQ joint is photogenic, and taking food pictures can become repetitious, but the folks who do this hard, hot, backbreaking work are endlessly fascinating to me. I’m happy to be able to share this gallery of pictures from my visits to barbecue joints across the state. The first pitmaster, Kerry Bexley, owns a small town establishment with a loyal following from around the state--and the world. That would be Snow’s BBQ in tiny Lexington (population 1,164). Kerry cooks alongside a rare creature: the female pitmaster, in this case, the indomitable Miss Tootsie. Snow's serves up their exceptional 'cue just one day a week, Saturday, when the doors open at 8 a.m. to a line of folks eager for a barbecue "breakfast"--or take-out--and stay open until the meat is gone. On the left is a photo of Rick Schmidt taken in 1999, then-owner of Kreuz Market. In this photo he's illuminated by shafts of light created by smoke in the air as he stands at a counter in front of two of the shop's four pits. The next image is of Rick’s protégé, pitmaster Roy Perez, leaning against a massive smokestack in the “new” Kreuz Market. When Rick decided to move, he conceived of and built a pit room I often refer to as a cathedral of Texas BBQ. Roy Perez remains its high priest. One urban gem among small-town favorites is Pecan Lodge BBQ in the Deep Ellum district near downtown Dallas. Pecan Lodge’s original location was just a few blocks off downtown, but after a couple of years, the popularity of the place with locals demanded owner Justin Fourton made a move to a roomier location. Louie Mueller Barbecue is in Taylor, a small town that may one day be gobbled up by Austin. For now, though, Wayne Mueller is running the show, mindfully preserving another of Texas BBQ's genuine architectural treasures while making the changes necessary to modernize a business renowned in particular for their sublime beef ribs. Bryan is a small city of 78,000 with several first-rate barbecue options. 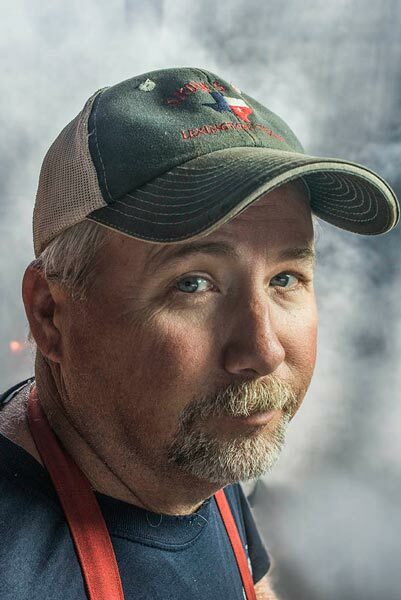 Alan Caldwell, owner and pitmaster of Fargo’s Pit BBQ, has built a sizable clientele for his meats, which were described as “spectacular” in the 2013 edition of Texas Monthly's influential "50 Best BBQ Joints" issue. I was struck by Alan’s sense of style in decor, clothing and transportation. As you can tell from his portrait, it’s all about blue. We finish with a couple small town favorites, the first of which is Marlin (pop. 5,800) where Bennie Washington operates Whup’s Boomerang Barbecue. A little shop on the south edge of town, Whup’s is open Thursday through Saturday. Most of their trade is take-out, but there are a couple of tables on the patio. Bennie is a lovely, warm fellow with a beautiful face. On the right is Kenneth Laird runs a little barbecue shop in Llano (pop 3,300). Cooper’s Old Time Pit Bar-B-Que is typically seen as this small town's claim to BBQ fame, but Laird's Bar-B-Q and Catering is where the locals go for their smoky meats. Kenneth has been in the barbecue game since the late ’60s--at one time he actually ran Cooper’s--but has been serving up 'cue at his own place since 1993. He's one-man army, cutting his own mesquite firewood and handling all the cooking, right down to the potato salad. Mr. Laird is a wonderfully gregarious fellow with a country accent as real as he is. Wyatt McSpadden is a photographer based in Austin, Texas. Through the years, his travels to barbecue joints across the state have become frequent, whether shooting for Texas Monthly; his own book, Texas BBQ; or simply enjoying the pleasures of traveling Texas' back roads to make pictures. Photographer Wyatt McSpadden explores the wonders of Texas barbecue in this series of pitmaster portraits.